The Accidental Time Capsule: I was in Physics Club? It’s been six months since we moved into our new place, and I ran across that box. “Oh, I know the one,” you might say, “Coat hangers, expired coupons, a tangle of wires that probably belonged to John’s college stereo, and the mail that was delivered on the day you moved?” Nope, not that box. I already unpacked that one! I’m talking about the other one. The long-forgotten jr. high yearbooks full of awkward brace-face kids in acid wash jeans, who, right now, all across this land, are awkwardly parenting their own brace-face kids in skinny jeans. The senior yearbook, with all of the hand-written notes promising to be friends forever, never imagining we would have to keep that promise on Facebook 20 years later. I immediately sat down with a cup of tea and flipped through it because…because I am a human, and my kids were at school. Man, we were young, and because we were a generation that lived our teenage years before the flat iron, our hair was so…fluffy. I have my share of memory issues these days, but I thought I remembered everything from high school. I was in Physics Club?? The weathered copy of Biography Magazine from September of 1998 with a winsome memorial portrait of Princess Diana on the cover along with the ratty address label from our poorly insulated newlywed apartment. An address book made obsolete a decade ago by our globe-trotting, transient cadre of friends. (Does anybody need to know where they lived in 1997?). The cover of the address book is Renoir’s painting, “Luncheon of the Boating Party,” purchased during my first grown-up shopping spree that also included my first business suit (wool, navy, pleated, unflattering), a big wicker hamper, and a sauté pan. At the bottom of the box are the heavy books that once sat on a bookshelf we no longer own in a home we no longer own: a tome about California’s cities by one of my favorite college professors; a book on the 1992 Los Angeles riots seemingly published as the riots were still happening; and the 1992 Newspaper Designer’s Handbook that simultaneously overestimated the future existence of newspapers and underestimated the impact of technology on the once-safe field of newspaper journalism. I refuse to get rid of it. It might still come in handy. When we moved from the suburbs to the city earlier this year, we downsized our belongings by 40-50%, yet the stuff in this box remained creating an unofficial, accidental time capsule – one I did not even put together myself. I’d been out of the hospital for a few days when John, and his quiet army of thankfully non-judgmental volunteers, helped get our move started while I lay in the other room eating Jell-O. In recent years, I’ve really worked on overcoming my pack-rat tendencies, and tried not to be so sentimental about stuff. This stuff though? This stuff made it this far, and through multiple moves. It could stay. I separated the box’s contents, and they were quickly absorbed by the rest of our belongings – a shelf here, a cabinet there – with the 1992 Newspaper Designer’s Handbook at my bedside for quick reference. Also, I just ordered my son’s 8th grade yearbook, and it’s time to put down the tea cup, stop looking backward for a while, and focus on a freckly face that will soon appear in the pages of that book. *The pic up there? 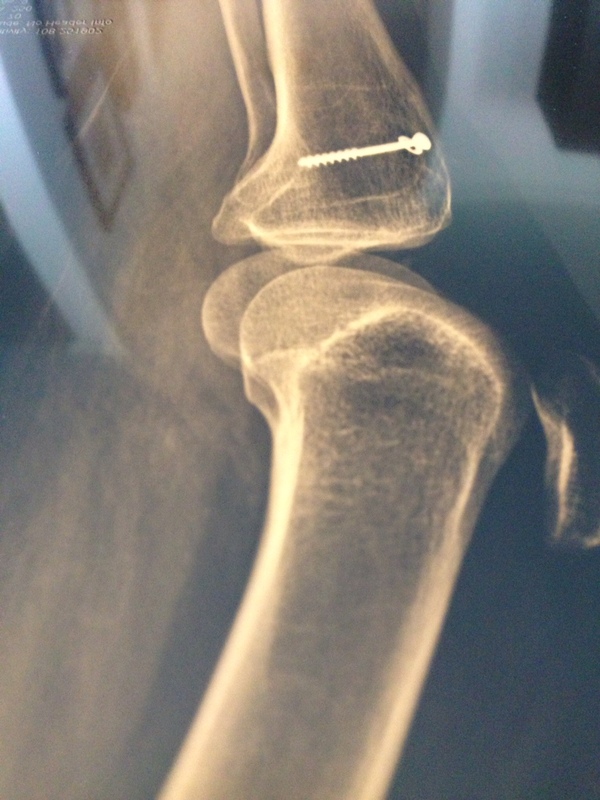 That’s my knee, and my hardware. ** That down there is from my senior yearbook. 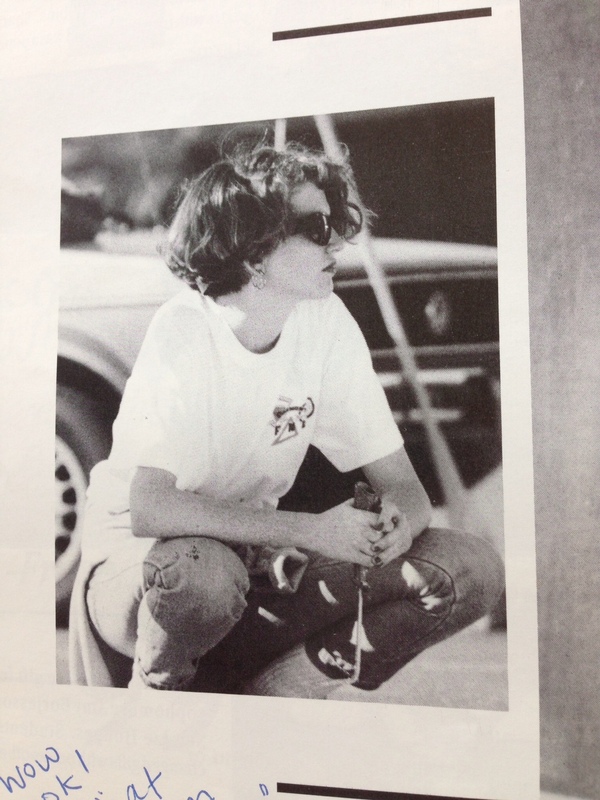 That’s me, at 17, with my new wave/middle aged lady haircut. the sun is but a fickle muse. especially when there is ice cream involved. Another good Fulcrum Chronicle! We have boxes that came with Sam in 1960 when we were married and he hasn’t looked through them yet. I shudder to think what we might find. Sorry for the delay! Thanks again Cathy, for reading and for your sweet note!